Join with us in our passionate pursuit to help leaders, future leaders and organizations become the best they can be by becoming a Certified Global Partner of John Mattone-Global. 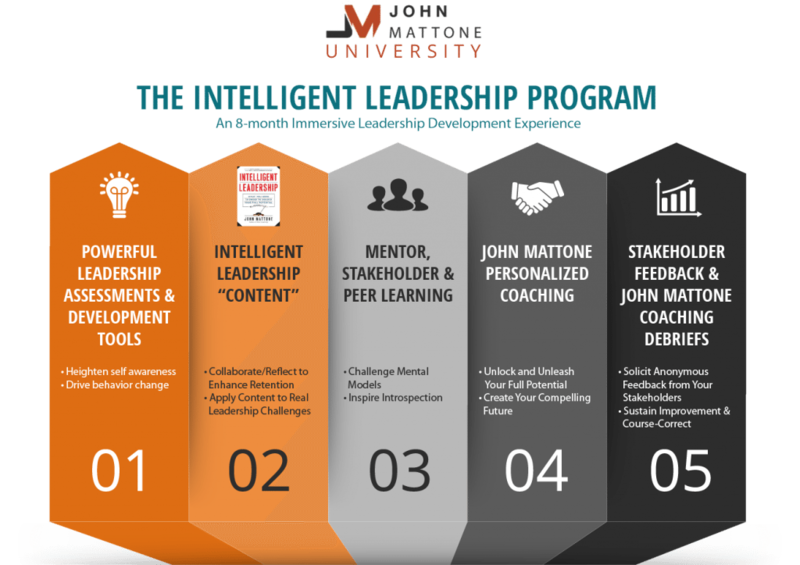 Here’s your chance to partner with John Mattone, the world’s #1 authority on Intelligent Leadership and the world’s top executive coach (and former coach to Steve Jobs), and offer your clients and prospects the John Mattone University (JMU) signature collection of leadership development solutions—including The Intelligent Leadership Program (see infographic below), recognized as one of the world’s top three advanced leadership development programs. In addition to offering the JMU signature collection, becoming a John Mattone-Global Certified Partner will enable you to offer his award-winning and powerful collection of culture and leadership assessments, tools and resources as well. We would love to have a conversation with you about becoming a John Mattone-Global Partner. First things first, there is a financial/capital investment required. As long as you meet the requirements below, we make it easy for you to join our Partner ranks. We are offering exclusivity (based on territory) on a first come first served basis. We are offering an attractive revenue-share % to start and based on your results, you can earn a greater %. We have done our homework, our revenue-share %’s are the best in the field of leadership development. You can make a lot of money by adding a “money in the mailbox” revenue stream to your business. Keep reading below and let’s set up a call! You share our passion: for businesses to realize their potential they must create and sustain strong and vibrant cultures in support of operating imperatives and they must strengthen their leaders and future leaders. You want to add world-class leadership and culture assessments, products and tools to your current portfolio of offerings. You are excited to add a new revenue stream to your business (“money in the mailbox”), with little time investment (other than marketing and positioning your new products/tools to your clients). You currently own/run a B2B services company such as a consultancy (HR or Strategic Management), an executive coaching firm, a training company, a boutique retained executive search firm or corporate accounting firm. You think adding a best-in-class, world-renowned brand in an allied field would add prestige to your enterprise and expand your opportunities with your current client base and beyond. The ability to invest an initial $10,000 USD (Silver Family Member); $25,000 USD (Gold Family Member); or $50,000 USD (Platinum Family Member) in John Mattone-Global, Inc. (see what you receive in return below). We offer flexible payment plans. Have an introductory “launch” call with John Mattone himself and his senior executive team. Receive your personalized one-year “roll-out” plan and schedule of the required certifications you will receive that will enable you to add significant revenue to your business. One-on-one coaching and personal mentoring — everything you need to get off to a fast start (coaching conducted by John Mattone and his team). *You will be certified as one of John Mattone’s Intelligent Leadership Certified Coaches, enabling you to offer your services as an accredited executive coach under the John Mattone brand. This certification is worth hundreds of thousands of dollars and more in itself. Once you achieve your “Initial Mastery” Certification as an Intelligent Leadership (IL) Executive Coach, our goal is to then work with you so you achieve “Advanced” and “Master” level IL status. There are five advanced IL programs that you will participate in over the course of the year, that will raise your game as a certified IL coach. The benefit? Your brand and business will grow and you will earn potential referral opportunities from our team as a coach and also have the opportunity to work with John on his coaching projects and learn from the best coach in the world. Support from John Mattone-Global HQ. Our management team consists of highly talented professionals. Lively two-way communication is “business as usual” for us. We’re always tuned in and available via phone or email to answer any questions or help you solve problems. The entire management team is committed and focused on helping you succeed in all ways!